The Think Vascular Intervention Course is designed for vascular surgeons, general surgeons, phlebologists, interventionalists and any other physician treating veins who are looking to participate in an immersive hands-on training experience to more fully prepare themselves to treat venous patients. Fellows in their final year are eligible for consideration. Courses are limited in size to preserve the quality of the hands-on experience. To be added to the list of interest, please select a date and a Merit Medical Representative will contact you to discuss course availability. Dr. Elias is director of the Center for Vein Disease at Englewood Hospital. He is board certified in venous and lymphatic medicine and in general surgery and completed a fellowship in vascular surgery at Englewood Hospital. Educating new and current practitioners is the cornerstone of Dr. Elias’s commitment to modern vein care and its impact on patient outcomes. He is the founder of the American Venous Forum Fellows Course in Vein Disease, as well as the founder and course director of the annual Expert Venous Management Summit. He is the medical director of VEIN Magazine and the medical editor of the American Venous Forum’s newsletter, Vein Specialist. Dr. Elias’s clinical interests include all aspects of minimally invasive vein care; he is also committed to procedure development and teaching. He has lectured, written, and taught about vein disease both nationally and internationally. He has been principal investigator/investigator on numerous clinical trials and performed the first ClariVein procedure on a human. His societal memberships include the American Venous Forum, the Society for Vascular Surgery, the International Society of Vascular Surgery, the American College of Phlebology, and the American College of Surgery. He is a Fellow of the American Board of Venous and Lymphatic Medicine and of the American College of Surgeons. 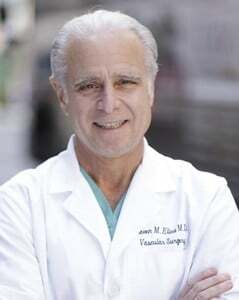 He has been director of the vascular vein programs at the Mount Sinai Vein Center and at Columbia University.